They say a picture is worth a thousand words. 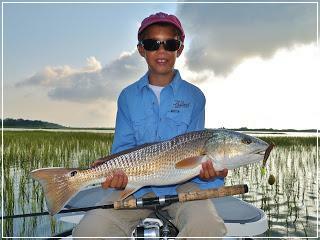 My young sportsman Ashe Hamrick filled some big shoes today catching his first redfish ever and he did it all by himself. Ashe stands at a whopping 55" tall, his redfish 27" long and over eight pounds. Needless to say the fight was epic and Ashe used some great form to best the big red. We were fishing a high flooded grass flat with a Redfish Magic Spinnerbait and Ashe was making nice casts parralel to the grass edges. While Ashe was slow rolling the spinnerbait back to the boat the redfish made an aggressive bite not three feet from the bow of the boat! I swear I saw sky between Ashe's feet and the boat deck. Congrats Ashe on your first redfish, I am so proud I got to share this with you and you are fast becoming one well rounded angler. I look forward to our future adventures together! The fishing in Wilmington, Topsail, Bald Head and surrounding waters is on fire. Don't miss your opportunity to get in on some great sight fishing action on the Cape Fear Coast of NCc.